Ballycarrickmaddy Primary and Friends’ School, Lisburn are the latest two schools to win places in the semi-final of the BBC Radio Ulster School Choir Of The Year. 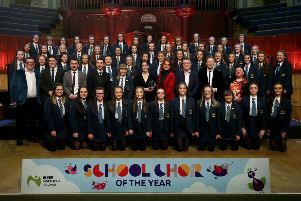 Over the course of the next three weeks choirs from across Northern Ireland will be singing to impress as they battle it out for a place in the final of the prestigious BBC Radio Ulster School Choir Of The Year. Presented by John Toal and Kerry McLean, the series is recorded at seven venues across Northern Ireland, with the fifth programme being broadcast on Easter Sunday on BBC Radio Ulster. The series, part of BBC Music NI, will culminate in a live final from the Ulster Hall, Belfast, on Sunday, April 17. Competing for a place in the semi-final in the sixth round recorded at The Craigavon Civic Centre with presenter Kerry McLean, were, in the Junior category: Markethill Primary School, Armagh; Ballycarrickmaddy Primary School, Lisburn; St Michael’s Primary School, Belfast; Tandragee Primary School; Harding Memorial, Belfast and St Francis Primary School, Lurgan. In the Senior category, the schools competing for a place in the grand final were Friend’s School, Lisburn; St Catherine’s College, Armagh; St Mary’s High School, Downpatrick; Priory College, Holywood and Banbridge Academy. It was Ballycarrickmaddy Primary (junior category) and Friends’ School (senior category) who impressed the judging panel, made up of Richard Yarr, Senior Producer Classical Music, BBC Radio Ulster; Ciaran Scullion, Head of Music with the Arts Council of Northern Ireland, and Rebekah Coffey, soprano and coach with the Ulster Youth Choir. The competition is produced in association with the Ulster Youth Choir.